Up on the rooftops, Leo is taking his brothers for the usual practice run. They’re all sick of running along the same rooftops every night and Mikey suggests they spice it up: First one to the highest rooftop wins. The Turtles accept the challenge and proceed to one-up each other with higher and higher climbs. At the top of one roof, however, they find everything covered in dense flora. The Turtles contemplate who would landscape the roof of a building into a thick jungle and their question is soon answered: Snakeweed! The mutant plant proceeds to trounce them for invading his territory. The Turtles attempt to slice his vines, but aren’t making any progress. Leo suggests they contain him and Raph drops a giant container of concrete on top of the villain. Unfortunately, it’s “Enhanced Fertilizer Concrete” (hence how Snakeweed was able to cultivate a garden on a rooftop) and it only makes Snakeweed more powerful. The Turtles wonder if things could get any worse, which of course they do. A thunderstorm suddenly rolls in and the fresh rain combined with the fertilizer causes Snakeweed to grow to giant proportions. Mikey dubs him Super-Snakeweed before getting smashed with a humongous claw. Donnie suggests that they can use Super-Snakeweed’s height against him, but they have to get him to the tallest location they can find. The Turtles reignite the roof race and lure Super-Snakeweed from his garden. Using a vine, they scale a nearby skyscraper, with the evil mutant hot on their heels. Once they reach the roof, Donnie tells his brothers to discard all their weapons. Reluctantly, they cooperate. Super-Snakeweed arrives on the roof and taunts the Turtles for surrendering by seizing their discarded weapons… their metal weapons. 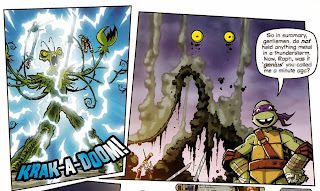 Thanks to his height and the addition of metal conductors, Super-Snakeweed immediately attracts a bolt of lightning, which reduces him to ash. A job well done, Mikey suggests a “reverse roof race” down to the street for some pizza. As the Turtles leave, they fail to notice a sprout popping out of the pile of ash. 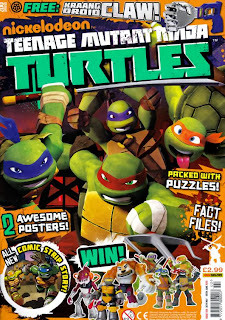 *This story is continued from TMNT Magazine (Panini) #1. 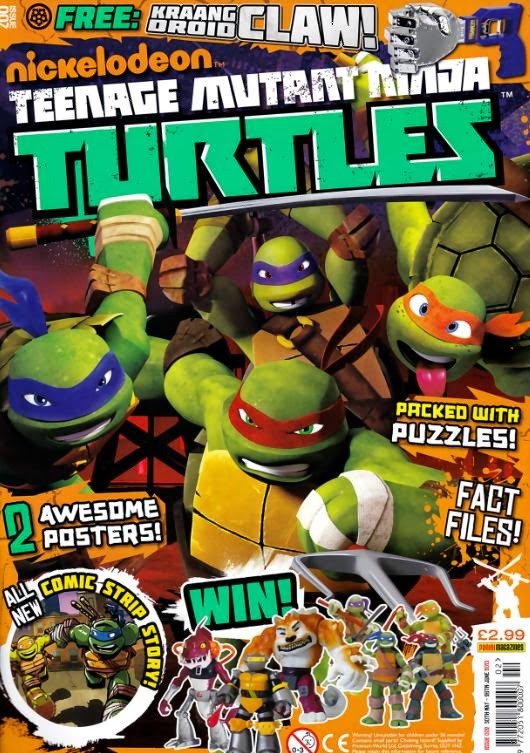 The story continues in TMNT Magazine (Panini) #3. 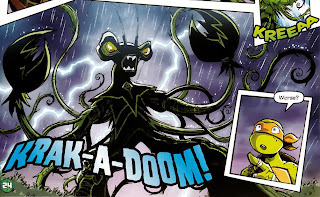 *Coincidentally, just two months after this issue was published, IDW’s TMNT New Animated Adventures #2 would similarly end with Snakeweed being defeated by a bolt of lightning. Man, Snakeweed isn’t really much of a villain, is he? 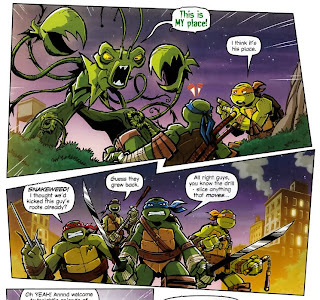 I went on about my unimpressed opinion of him in my TMNT New Animated Adventures #2 review, so I won’t repeat myself. But yeah, he’s kind of lame. Heck, in this story I’d argue that he isn’t even a villain at all. He has no evil scheme of any kind. And outside of maybe some zoning laws or lacking a landscaping permit, he’s not even committing any crimes. Basically, the Turtles stumble into his home and start beating him up. This issue came out only a couple months before IDW tried their hand at a Snakeweed story and the two don’t compare favorably. Snakeweed actually has a diabolical plan that the Turtles have to thwart over in the IDW story. In this Panini comic, he’s just sort of an angry neighbor the Turtles torment. 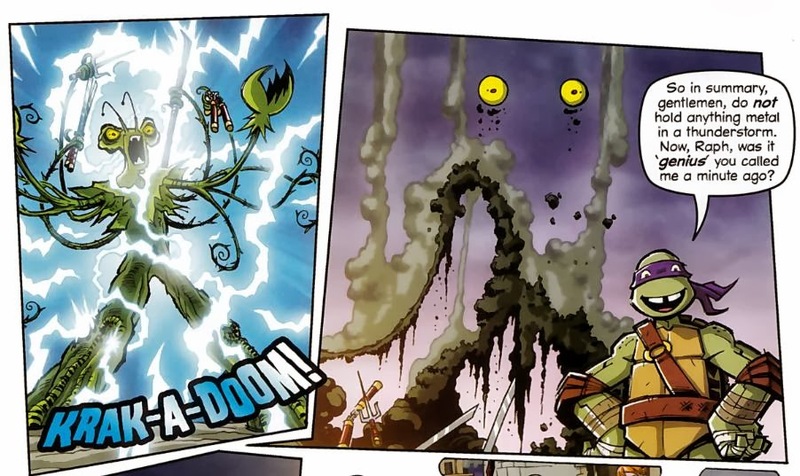 The fact that both comics end with Snakeweed getting defeated the same way is a strange coincidence, though. Still, while the Panini Snakeweed comic lacks the “epic save the world” stuff of the IDW Snakeweed comic, I will admit that the brisker, more comedic take sets it apart from its American contemporary. Bove and Caruana work in some fun sight gags (such as the thought-bubble fantasies that bookend the story) and, as before, they have a good handle on the voices of the characters. And it's not their fault Snakeweed is such a boring villain that spouts generic dialogue along the lines of, "Raarrgghhh! I'll destroy you, Turtles!". Jack Lawrence covers art duties this time around. Looking over the issues that have been released so far, unlike IDW, Panini doesn’t stick to a single artist for the title and seems content to cycle through a rotating staff of talent. The artists they employ are actually fairly consistent with each other, at least from what I’ve been able to tell, and I can’t say any stand out as substantially better than the others. Solid layouts, expressions and so on. I think the consistent coloring from Cordy probably helps hold it all together. This double-length adventure didn’t impress me as much as the two shorts from the previous issue. I think they probably should have used the extended length to develop a stronger story. 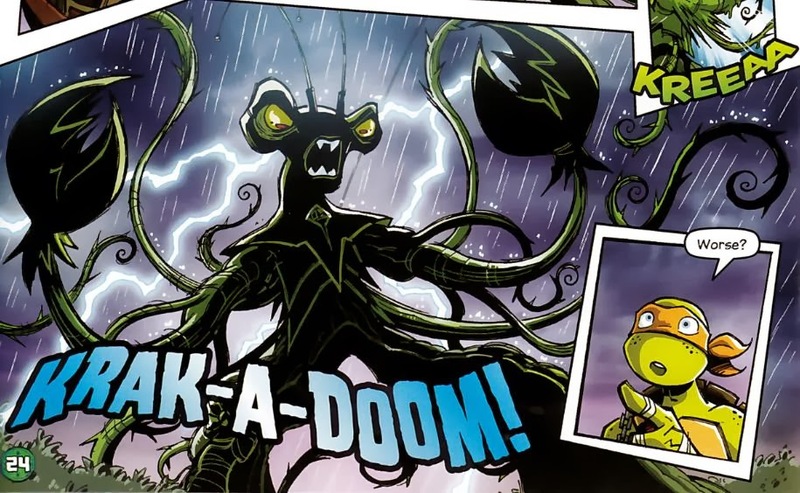 Still, it is interesting to compare the IDW and Panini Snakeweed stories, which came out only a couple months apart and both follow the same germ of a plot: “Snakeweed grows a jungle in New York, the Turtles stop him with a bolt of lightning”. Both are superficially the same, but execute the ideas in completely different ways. For my money’s worth, I prefer IDW’s effort, but Panini’s isn’t without its charm, either.